Now that you’ve gotten your hands wet, let’s talk about Godot’s design. Every game engine is different and fits different needs. Not only do they offer a range of features, but the design of each engine is unique. 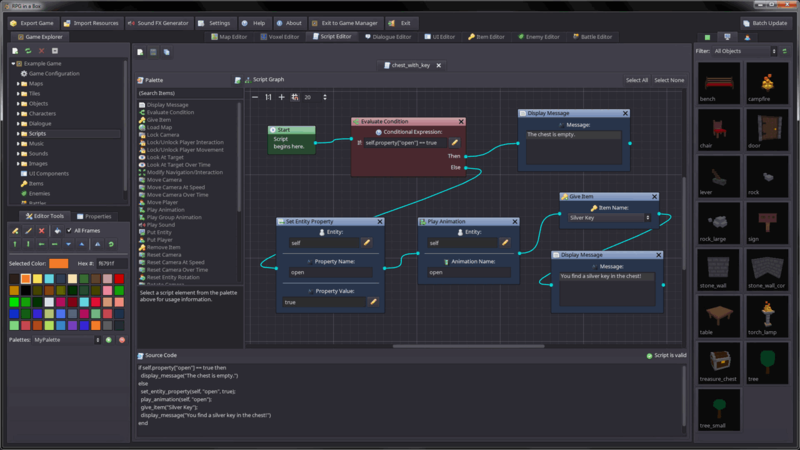 This leads to different workflows and different ways to form your games’ structures. This all stems from their respective design philosophies. This page is here to help you understand how Godot works, starting with some of its core pillars. It is not a list of available features, nor is it an engine comparison. To know if any engine can be a good fit for your project, you need to try it out for yourself and understand its design and limitations. Please watch Discover Godot 3, the Free game engine if you’re looking for an overview of the engine’s features. Godot embraces object-oriented design at its core with its flexible scene system and Node hierarchy. It tries to stay away from strict programming patterns to offer an intuitive way to structure your game. For one, Godot lets you compose or aggregate scenes. It’s like nested prefabs: you can create a BlinkingLight scene and a BrokenLantern scene that uses the BlinkingLight. Then, create a city filled with BrokenLanterns. Change the BlinkingLight’s color, save, and all the BrokenLanterns in the city will update instantly. On top of that, you can inherit from any scene. A Godot scene could be a Weapon, a Character, an Item, a Door, a Level, part of a level… anything you’d like. It works like a class in pure code, except you’re free to design it by using the editor, using only the code, or mixing and matching the two. It’s different from prefabs you find in several 3D engines, as you can then inherit from and extend those scenes. You may create a Magician that extends your Character. 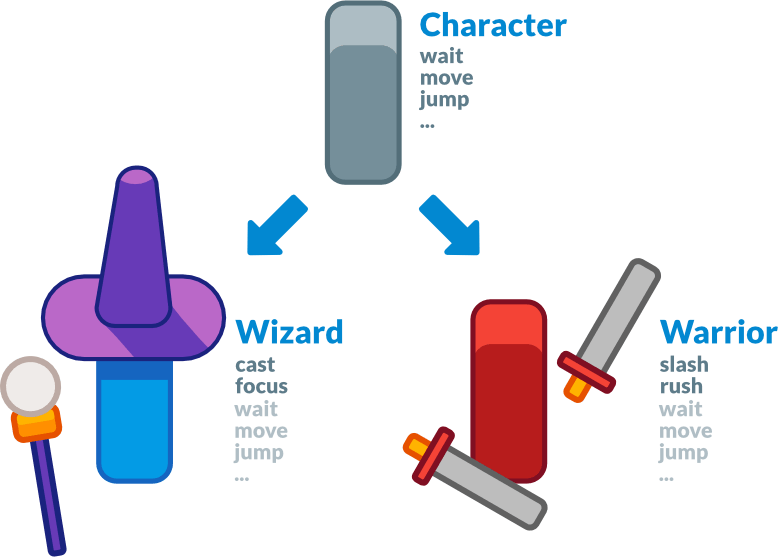 Modify the Character in the editor and the Magician will update as well. It helps you build your projects so that their structure matches the game’s design. Also note that Godot offers many different types of objects called nodes, each with a specific purpose. Nodes are part of a tree and always inherit from their parents up to the Node class. Although the engine does feature components like collision shapes, they’re the exception, not the norm. 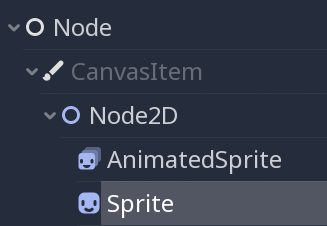 Sprite is a Node2D, a CanvasItem and a Node. It has all the properties and features of its three parent classes, like transforms or the ability to draw custom shapes and render with a custom shader. Godot tries to provide its own tools to answer most common needs. It has a dedicated scripting workspace, an animation editor, a tilemap editor, a shader editor, a debugger, a profiler, the ability to hot-reload locally and on remote devices, etc. The goal is to offer a full package to create games and a continuous user experience. You can still work with external programs as long as there is an import plugin for it. Or you can create one, like the Tiled Map Importer. That is also partly why Godot offers its own programming languages GDscript and VisualScript, along with C#. They’re designed for the needs of game developers and game designers, and they’re tightly integrated in the engine and the editor. GDscript lets you write simple code using Python-like syntax, yet it detects types and offers a static language’s quality of auto-completion. It is also optimized for gameplay code with built-in types like Vectors and Colors. Note that with GDNative, you can write high-performance code using compiled languages like C, C++, Rust, or Python (using the Cython compiler) without recompiling the engine. VisualScript is a node-based programming language that integrates well in the editor. You can drag and drop nodes or resources into the graph to create new code blocks. Note that the 3D workspace doesn’t feature as many tools as the 2D workspace. You’ll need external programs or add-ons to edit terrains, animate complex characters, and so on. Godot provides a complete API to extend the editor’s functionality using game code. See The Godot editor is a Godot game below. A State Machine editor plugin in Godot 2 by kubecz3k. It lets you manage states and transitions visually. Godot offers a fully open source codebase under the MIT license. This means all the technologies that ship with it have to be Free (as in freedom) as well. For the most part, they’re developed from the ground up by contributors. Anyone can plug in proprietary tools for the needs of their projects — they just won’t ship with the engine. This may include NVIDIA PhysX, Google AdMob, or an FBX model importer. Any of these can come as third-party plugins instead. On the other hand, an open codebase means you can learn from and extend the engine to your heart’s content. You can also debug games easily, as Godot will print errors with a stack trace, even if they come from the engine itself. This does not affect the work you do with Godot in any way: there’s no strings attached to the engine or anything you make with it. Godot is made by its community, for the community, and for all game creators out there. It’s the needs of the users and open discussions that drive the core updates. New features from the core developers often focus on what will benefit the most users first. That said, although a handful of core developers work on it full-time, the project has over 600 contributors at the time of writing. Benevolent programmers work on features they may need themselves, so you’ll see improvements in all corners of the engine at the same time in every major release. The Godot editor runs on the game engine. It uses the engine’s own UI system, it can hot-reload code and scenes when you test your projects, or run game code in the editor. This means you can use the same code and scenes for your games, or build plugins and extend the editor. This leads to a reliable and flexible UI system, as it powers the editor itself. With the tool keyword, you can run any game code in the editor. RPG in a Box is a voxel RPG editor made with Godot 2. 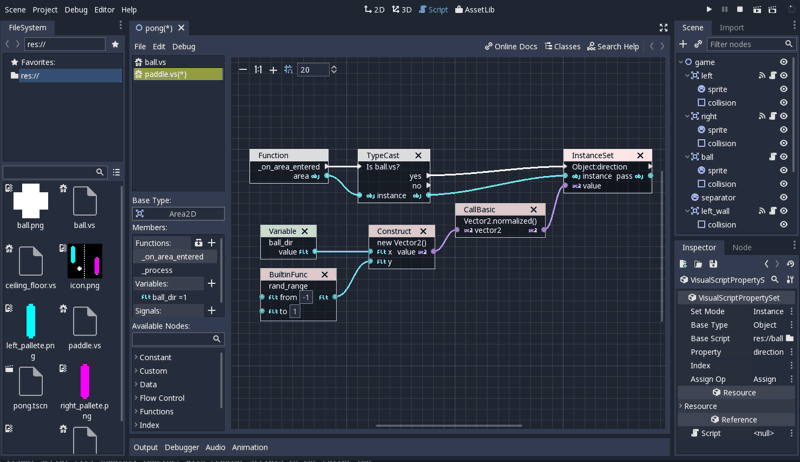 It uses Godot’s UI tools for its node-based programming system and for the rest of the interface. Put the tool keyword at the top of any GDScript file and it will run in the editor. This lets you import and export plugins, create plugins like custom level editors, or create scripts with the same nodes and API you use in your projects. Godot offers dedicated 2D and 3D rendering engines. 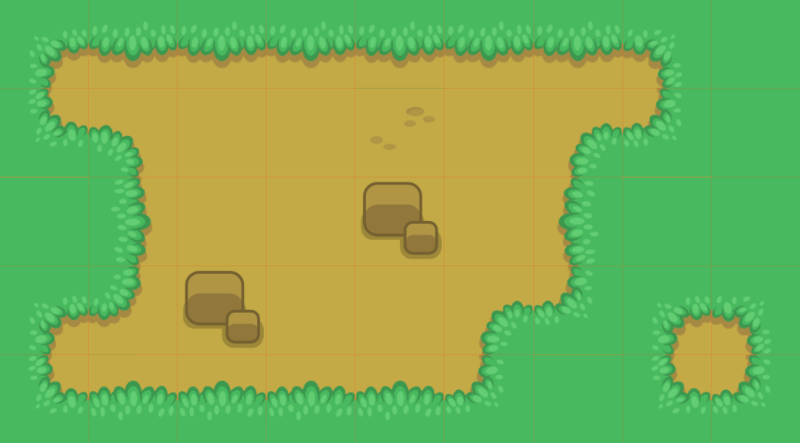 As a result, the base unit for 2D scenes is pixels. Even though the engines are separate, you can render 2D in 3D, 3D in 2D, and overlay 2D sprites and interfaces over your 3D world.